I’m hoping, if I manage to get some time at home on the computer this week, to have something for you every day now until Christmas! I’m going to change up the posting order a bit now, and go for the more complicated things that might take you a run to the shops and a little bit of time to complete and then wind down to last minute things that you can whip up quickly and have on the table or in the fridge ready to give out when unexpected presents arrive! 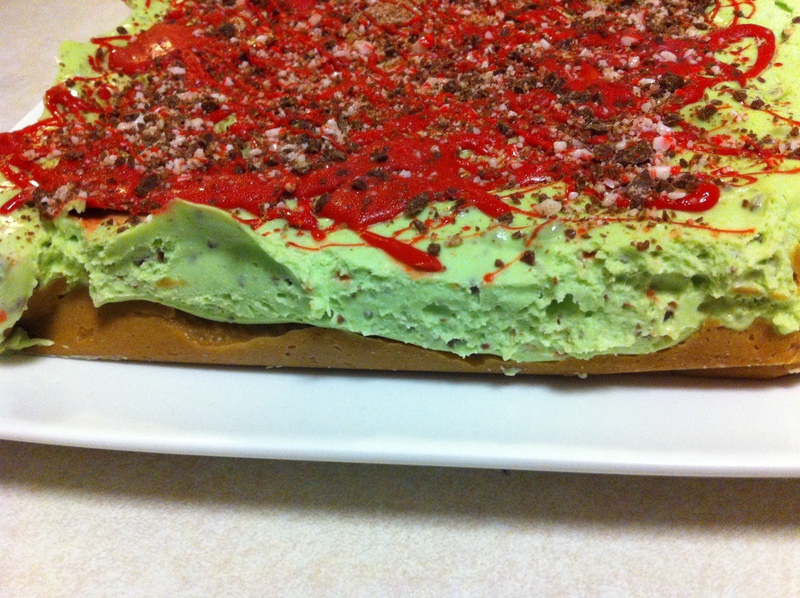 Today, I’ve got a yummy choc mint chip cheesecake recipe for you that’s entirely of my own invention. It’s obviously not one for your Christmas hampers, but a great dessert for all those festive catch ups that are happening at the moment. 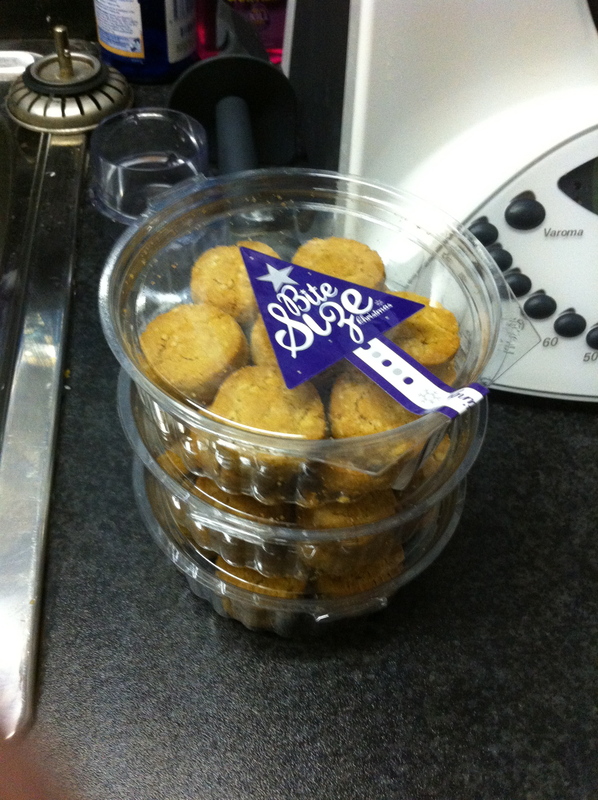 I received a box of Bite Sized Coffee Treats biscuits in Macadamia flavour as a part of their Bake Off competition that’s running over on their Facebook page. I was charged with creating a dessert using the Bites and I decided that something festive was in order. The result was perfect. 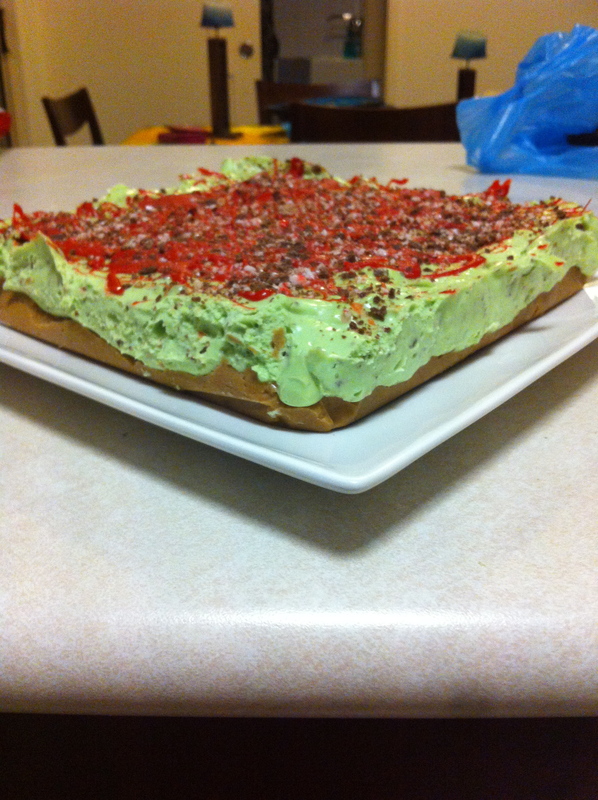 The filling was the perfect mix of cheesecake, mint and chocolate and was smooth and crunchy at the same time. The bites added a really strong, buttery flavour to the crust that I was impressed with. Ordinarily, a biscuit base is a fairly quiet accompaniment to whatever you fill a cheesecake with, but this crust held its own! Line a cake tin with baking paper. I used a 20cm square tin a with a loose base, but a round spring form will work too. My cake wasn’t very high, so I’d recommend using a smaller tin if you want a higher filling. Process your candy canes until they’re roughly chopped (not too fine or you’ll lose the crunch) and set these aside too. If you’re using big chocolate melts or a block, this will also need to be processed, then mix with your crushed candy canes. Process your biscuits until they’re a fine crumb and then set aside around 50gs for late. Add the cold butter to remaining biscuits and process until you get a soft dough, then press into a spring form cake tin (or one with a loose base that you can push out. Put in the fridge or freezer to cool. Mix your cream cheese with electric beaters (or mix master, or Thermomix) until smooth and fluffy. Add sugar and combine well, then add cream and beat until smooth. Beat in peppermint essence to taste and, if desired, add green colouring. Fold in 25gs (half) of the remaining biscuits and half of the candy cane and chocolate mix. This will add a minty, chocolatey, biscuity crunch to your cake. Pour mix over base. If you’re decorating, melt the red melts and spoon into a piping bag. Pipe lines back and forth over the cake moving from one corner to the opposite corner, back and forth and the repeating for the other two corners. Top the cake with the remaining candy cane, chocolate and biscuits. I added a bit more red chocolate to this to make sure it stuck. Leave in the fridge to set overnight, or, if you’re in a hurry like I was, you can freeze until around an hour before you’re going to use it. It just needs to be set enough to lift out of the tin and cut without squashing. I chopped this into around 20 small squares, which, for this recipe, makes it 5 ProPoints a serve – pretty damn good for a dessert that’s so rich! Now, if you like the look of my cake, please, please head over to Facebook and Like the Bite Size coffee treats page, and then click here to like any one of my pictures to vote for me (and please excuse the TERRIBLE photos. It’s times like these that I realise my iPhone is not an adequate indication of what my food looks like!). They’re only tallying votes if you’re one of their page likers, so please make your vote count! If you feel like sharing this for your Facebook friends as well, I’d really appreciate it.